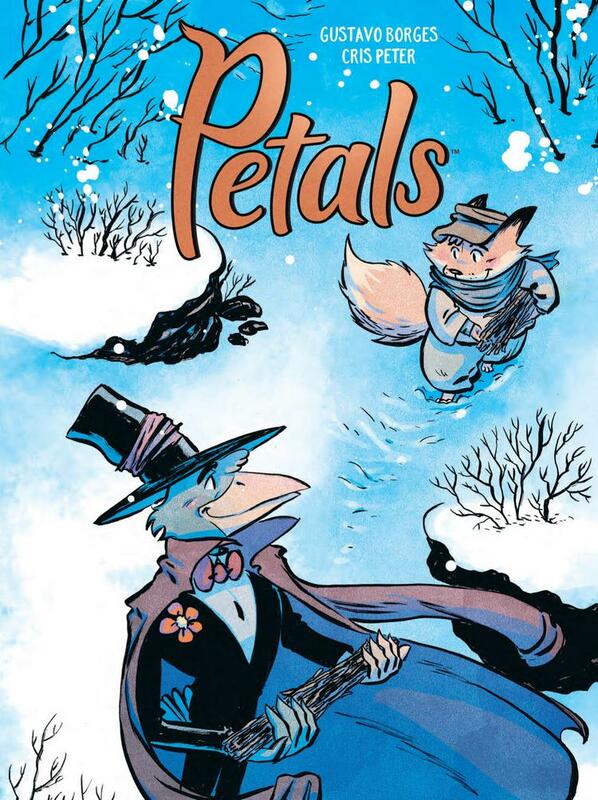 A beautiful tale that will tug on your heart strings, Petals is the “silent” creation of writer/artist Gustavo Borges and colourist Cris Peter. This is a special work that says so much in such a little slice of time, something that is rarely found in this medium anymore. Where OGNs are concerned, oftentimes space is not an issue, for lack of a better term, and stories can become bloated. In the world of monthly single issues, stories are patterned in 22 page chunks sprawling over a six issue arc, sometimes when a five or four issue arc would serve the story better. Petals, however, tells a heartwarming tale of friendship in a meaningful way with a page count that is, as Goldilocks once stated, just right. My wife has mentioned to me that she evaluates stories based on whether or not the storyteller has made her care. Petals made me care on the first page. Gustavo Borges’ expressive images draw readers into a world that has the sweetness and innocence of Winnie The Pooh, and his choice to forgo dialogue in this tale makes Petals all the more charming. This tale of a young fox hoping to heal his ailing father is so sweet, I found myself smiling almost constantly while reading it. The fox’s new friend that he meets in the forest has the charm and magic of Willy Wonka, bringing life and hope to the bleak fox home and I found their tale of friendship actually filled me with hope. In this beautiful forest world there can be hope for kindness, which fills most every panel Borges and Peter have crafted here. Cris Peter’s colour work is amazing, setting a tone over Borges’ pencil work that is comforting and cozy. Even the snow isn’t cutting or harsh, or at least not stark enough to snuff the goodness in these characters. Her work brings a charm to pencils that are comforting like reading a classic children’s story, and I cannot applaud her work enough. Spoiler warning, in this next section I will discuss the ending of Petals. I mentioned earlier that Petals will tug on your heart strings…honestly, that’s the cute way of saying that it will turn on the waterworks. I was so invested in these characters that when a moment of great loss occurs, I was devastated. For that reason, I must say that even though this graphic novel is appropriate for readers of all ages, it is best to know your audience before you gift or read Petals to a young soul. As an adult who has dealt with loss, I can see the beauty and poetry in how Borges tells this tale, and even though the loss hurts, I can see that not all losses are the end of good in life. This “warning” is meant in no way to discredit Borges’ storytelling choices, but rather as a parent hoping to equip other adults & decision makers with the necessary information to make a choice for their specific situation. All of this said, an argument could easily be made that Petals is a useful and brilliantly crafted tool to discuss the difficult topic of loss in a manner that isn’t so scary and stressful for young readers. This is 100% a “know your kid” situation. Creating a story that is gripping without using any dialogue is not an easy task, but Borges and Peter have succeeded with Petals. The loss I spoke of previously is powerful because of the amazing connection these creators build, drawing readers into a world of happiness, charity and hope. Petals is a beautiful work that has the look and feel of a modern day classic that can be read again and again.